Not to string you along, but I’ve been looking forward to sharing this month’s tutorials for a long time! There is a tie that binds, a common thread, that weaves the cookies together in this month’s McGoo U. We will create a sweet floral embroidery hoop, a simple yet stunning dream catcher, and a string art cookie that is so fun: I know you’ll nail it! Some of the techniques we will use are piping, a review on my cheater pants roses, “suede”, and my wood plank background. I promise the instruction won’t leave you stranded; it’s a really good yarn. You know her. You love her. Our re-curring Expert Lab guest professor Georganne Bell of LilaLoa teaches us how to make incredible glow in the dark cookies! She uses her glowing formula to transform her laser tag cookies from a yummy treat to an illuminating and fun party trick. Get your glow on! 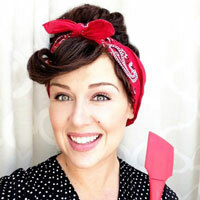 This month our Mixing it Up turns into “Beating it Up” with a baker’s challenge. 2 cookiers. 8 eggs. 1 is raw. See a new side to these two as Georganne and Arty go yolk to yolk. Will it be a “sunny side”? Does anybody get scrambled? Who will end up with egg on their face?! Watch and find out. In this month’s Smart Cookie we cookie smarter by creating a simple and rustic cookie design that will take less than 15 minutes from start to finish INCLUDING drying time. Now that’s smart! After School we get our sweat on: cookie style! As we all know cookies decorating can feel like a workout from lifting those 50 lb bags of flour and rolling out chilled dough, to mixing colors. We imagine a workout that helps train cookie decorators and get a good workout. You’ll see lots of familiar faces in the gym today: Yoli Idos of Yoli’s Yummies, Laurie Anglen of Cookie Bliss, Monica Holbert of Cookie Cowgirl, Andrea Walters of Andy Kay’s Cookies, and of course Georganne Bell of LilaLoa. Don’t be a cupcake! Feel the burn! As always we finish off the day with a relaxing and impromptu design using the Extra Frosting from class. Need the perfect dress cookie cutters?